Does “Sell in May and Go Away” Work in Forex Trading? If you’ve been watching the financial markets for quite some time now, you’ve probably heard of the adage “Sell in May and go away.” Simply put, this refers to an equities trading strategy based on the observation that stocks typically undergo a long selloff period from May right until October. Apart from that sharp mid-month selloff, that decline wasn’t so bad! In fact, the index was off to a good start during the first couple of weeks in May 2013 then managed to trend higher until October. Although the validity of this “Sell in May and go away” theory and the rationale behind the repeating market behavior is still debatable, several traders attest to this self-fulfilling phenomenon. After all, this seasonal trend has taken place for years and traders can be a little bit superstitious sometimes. Just ask Dr. Pipslow who insists on wearing his ratty old “lucky socks” while day trading! Intermarket analysis tells us that price action in the equity markets has an impact on forex price movements. A sharp selloff in the stocks, which usually takes place when traders rush to close their long positions, could lead to risk-off market moves in the forex arena. This suggests that safe-haven currencies such as the U.S. dollar or lower-yielding ones like the Japanese yen could gain support while higher-yielding and riskier currencies like the comdolls could lose ground. 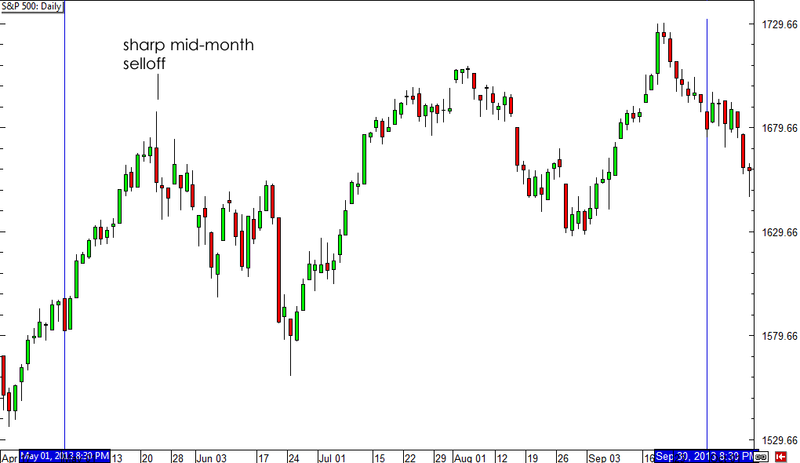 Do you believe in this “Sell in May and go away” theory? Cast your votes in our poll below or share your thoughts in our comment box!